LOS ANGELES, CA--(Marketwired - Jan 14, 2015) - Blaze Fast-Fire'd Pizza, the nation's largest and fastest growing build-your-own pizza chain, today announced that it has signed a franchise agreement with Five Star Blaze Holdings, Inc. to develop Blaze Pizza restaurants in Canada. The deal includes plans to open a minimum of 60 franchise units. The fast-casual pizza chain, known for its chef-driven recipes and casually hip restaurants, is targeting Toronto, Edmonton and Calgary for the first restaurants. Five Star Blaze Holdings, Inc. is a wholly owned subsidiary of Cypress Five Star, LLC and is led by Robert Baxter, Blair Walker and Darven Erickson. Cypress Five Star, LLC is the largest franchisee in the Five Guys Burgers & Fries chain with 41 franchise restaurants in Canada and, through an affiliate, two additional franchise restaurants in Wyoming. The development area for Blaze Pizza includes the Canadian provinces of Ontario, Alberta, British Columbia, Manitoba and Saskatchewan. "The global trends behind the booming fast-casual restaurant segment -- better quality, customization and premium environment -- are also driving Blaze Pizza's popularity and rapid expansion," said Mr. Baxter. "We've already introduced fast-casual burgers to Canada and are excited to do the same with fast-casual pizza." "Pizza is a huge category but, if you think about it, there really isn't an option for a good fast pizza," added Mr. Walker. "What Chef Brad did was to create a fast scalable process for artisanal pizzas that is simply amazing. We think that Blaze Pizza's assembly-line format will translate successfully into Canada as well as around the globe." With the planned opening of its 70th U.S. location this quarter, Blaze Pizza will be operating in 17 states, including the major metropolitan areas of Los Angeles, New York, Chicago, San Francisco, Dallas and Washington, D.C. The brand is opening on average one new restaurant every five days -- with its milestone 100th location projected to open later this year. "We're very pleased to be entering Canada with the experienced leaders at Cypress Five Star," said Jim Mizes, president and COO of Blaze Pizza. "This is our first international deal, so we were very careful to select the right franchise partner. We feel that Cypress Five Star has the proven track record, financial capital and local Canadian market knowledge necessary to execute the Blaze Pizza brand to our high standards." 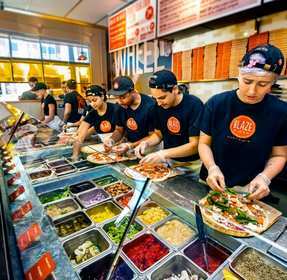 Blaze Pizza is looking to partner with other qualified, multi-unit franchise candidates to develop the brand in additional international markets. Ideal candidates will have proven multi-unit restaurant experience, strong financial capacity, and a deep knowledge of their local market. Blaze Pizza® is a modern day "pizza joint" known for its custom-built artisanal pizzas, freshly made salads, blood orange lemonade and s'more pies. Each restaurant features an interactive assembly-line format that allows guests to customize one of the menu's signature pizzas or create their own, choosing from a wide selection of fresh, artisanal ingredients -- all for under $8. The generously-sized 11-inch pizzas are then sent to a blazing hot open-flame oven -- the centerpiece of the restaurant -- where dedicated pizzasmiths™ ensure that the thin-crust pies are fast-fire'd® and ready to eat in just 180 seconds. Each restaurant makes its own dough from scratch using a recipe developed by critically-acclaimed Executive Chef Bradford Kent ("The Pizza Whisperer"), which requires a 24-hour fermentation period to produce his signature light-as-air, crisp crust. For pizza fans with specific dietary needs, Blaze Pizza offers gluten-free dough and vegan cheese. Described by Zagat as "One of 10 Innovative Restaurants in Los Angeles," Blaze Pizza is developing a cult following as it expands across the U.S. The prototypical restaurant is 2,400 square feet with seating for about 60 guests. Founded by Elise and Rick Wetzel (co-founder of Wetzel's Pretzels), the concept is backed by investors including LeBron James, Maria Shriver, Boston Red Sox co-owner Tom Werner and movie producer John Davis. For more information, please visit blazepizza.com and facebook.com/blazepizza.